For years, Mike Rex scheduled one or two weeks of vacation to coincide with the magical date of November 15. This is normally the peak of the rut in the Appalachian woodlands he hunts near his southeastern Ohio home. Like many trophy whitetail hunters, he planned his bow season around the rut. Because Rex lives within a bow shot of excellent whitetail habitat, he doesn’t limit his hunting to the rutting period. As soon as Ohio’s deer bow season opens in early October, you’ll find him climbing into treestands, mostly on weekends and weekday evenings after work. Rex’s early season efforts have paid big dividends. Of the 10 Pope & Young-class whitetails he has taken since 1990, eight have fallen before the peak of the rut, with six in October and two others by November 4. He admits that the two bucks he tagged during the rut were the result of long, hard, frustrating hunts, and a greater element of luck. Bowhunters are likely to see more bucks during the peak of the rut, which makes for exciting and memorable hunts. But, the fact is, a buck chasing a doe in the distance might as well be on the moon. Rex believes you stand a better chance of getting heavy antlers in bow range if you hunt harder before the rut. 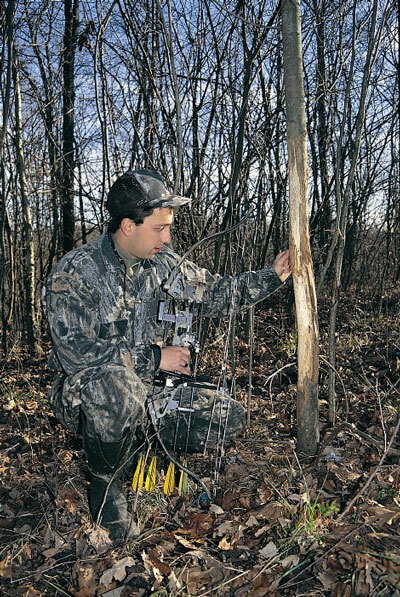 Bucks begin making rubs and scrapes long before the peak of the rut, and this early buck sign is often the most helpful. Early buck sign allows you to place high-percentage stands. Even though bucks check doe groups before the rut, they still travel regular corridors and move more predictably in response to the wind direction. Once the rut commences, dominant bucks may be with does far away from the rubs and scrapes they made only weeks before. 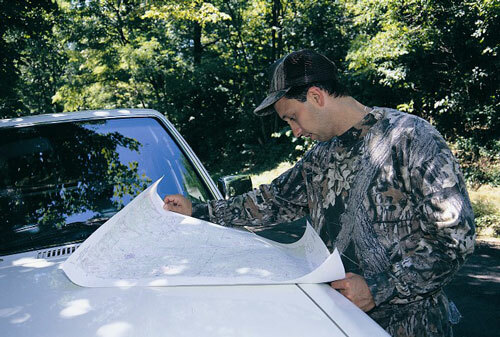 If you know a place where a scrape shows up year after year, give it high priority for an early-season stand. This strategy once produced a typical 10-point buck for Rex that netted a 149 6/8 score. The scrape was situated on a ledge along a side hill. It separated an overgrown clear-cut on the ridgetop from an oak flat below where deer were feeding on acorns. It was October 17 when Rex settled into a treestand 20 yards from the scrape on a warm, sunny evening. He dropped the buck when it stopped at the scrape while en route to the oak grove. During the peak of the rut, bucks eat on the run, if at all. Because their movements are dictated by the habits and location of does, it is unwise to set up near a food source, thinking it alone will attract a trophy buck. Conversely, prior to the rut bucks feed heavily in preparation for the breeding ordeal, so early season stands related to food sources can work to your advantage. Rex has found the earliest rubs occur where bucks feed, and this sign reveals which food sources are most likely to yield a trophy buck. He places his stands on travel routes leading to feeding areas and stays well away from the actual food sources. Even when you go undetected by feeding deer, the Big Boy may never show. Then you end up spooking the deer around you when you climb down due to darkness, which renders that stand location useless for future outings. A stand in a wooded funnel leading to a meadow produced a dandy buck for Rex last season in late October. About an hour before dark, a doe with a fawn browsed passed his stand as they headed for the meadow. Five minutes later an 8-point buck with a 23-inch spread browsed into bow range. The buck grossed 156 and netted an even 150 points. Many hunters believe morning stands are more productive during the rut, including Rex. But prior to the rut, Rex has fared so well hunting evenings that he rarely loses sleep in order to be on stand at first light. Since feeding areas are more reliable and easier to locate, an evening stand overlooking a travel route to a food source is more likely to result in a dream buck before the rut.